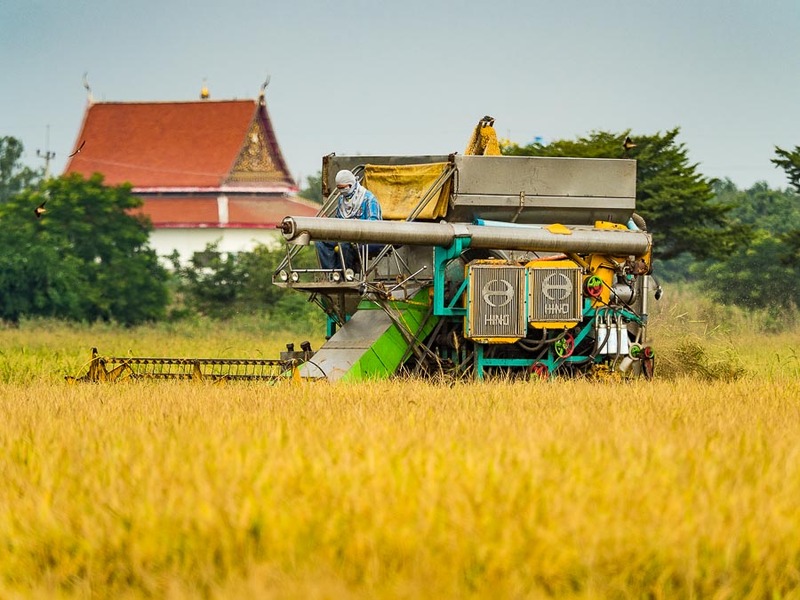 A rice harvester in a field in Ayutthaya province, north of Bangkok. The rice harvest is underway in Thailand. It's hard to overstate the importance of rice in Thailand. It's served, in one form or another, at almost every meal. Although Thai agriculture is incredibly diverse, when most people in Thailand think farmers, they think rice farmers. The rice industry accounts for about 10% of the national economy. 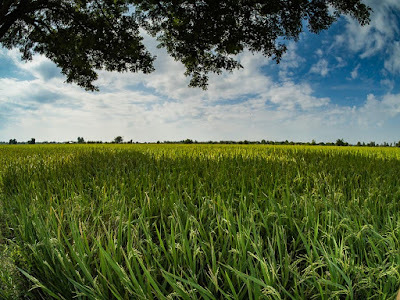 Get out of Bangkok and into the countryside and you'll drive through kilometers and kilometers of rice fields. I went up to Ayutthaya, about 90 minutes north of Bangkok, to photograph the harvest this week. A rice field just about ready to be harvested. The grains are plump and heavy and soon the field will go from green to dark yellow. That's when the harvesters hit the field. The harvest in central Thailand is mostly done with machines, similar to combines used on American farms (except they're tracked so they can get through the muck). A harvester can go through a field in a fraction of the time it would take to manually harvest the field. 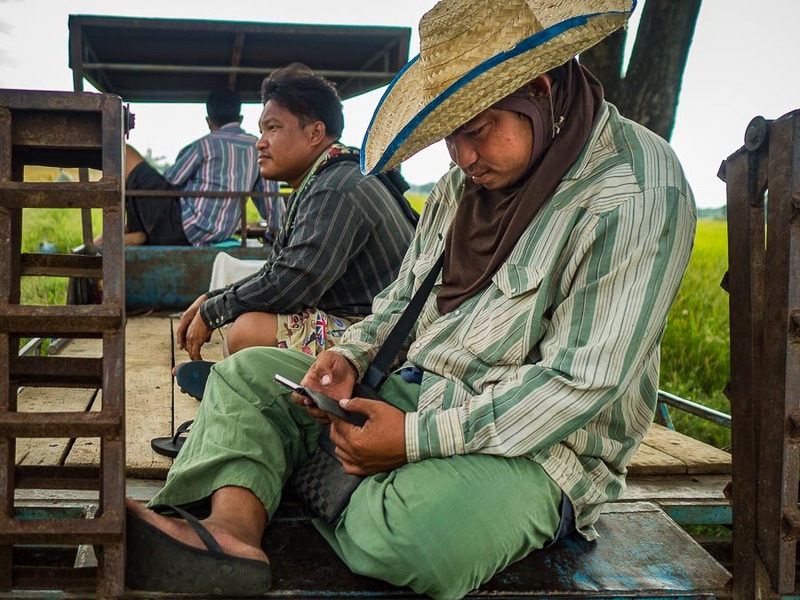 A farm worker checks his smart phone on the edge of a rice field. This year's crop is expected to be larger than last year's. At the same time, rice prices have tumbled, down to their lowest prices in a decade. This is creating problems for farmers who are harvesting rice that they will have to sell at a loss. In 2011 and 2012, PM Yingluck's government responded to low prices by buying rice at inflated prices and warehousing it, with the intention of selling it when prices improved. Things didn't work out that way though. 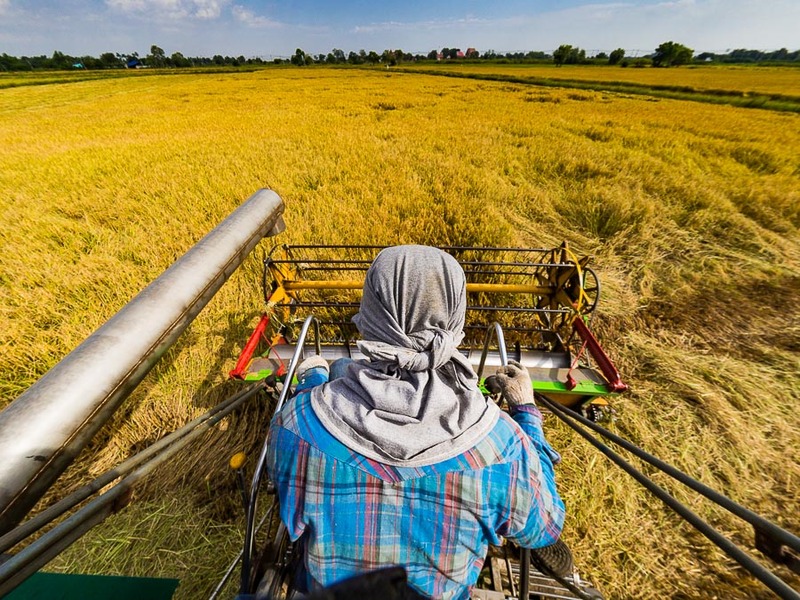 Other rice producers, principally India and Vietnam, took Thailand's place in the world rice markets. Prices never recovered and Thailand was left with mountains of rotting rice. Problems with the rice price scheme contributed to Yingluck's legal problems and the coup that ultimately unseated her government. 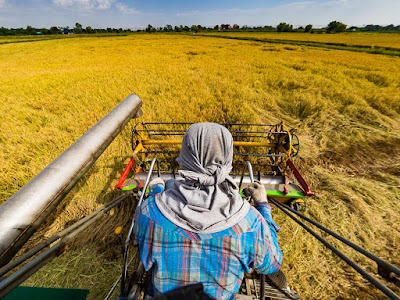 A harvester goes into a rice field. The current military dominated government is trying to avoid the populist measures adapted by Yingluck. But they are taking small steps to help farmers. The military has sent soldiers to rice mills and warehouses to voluntarily "encourage" mill operators to pay a higher price. The government will offer cash assistance to small farmers, to help them store rice. Both the Thai army and navy are buying rice for their kitchens directly from farmers rather than middlemen. Yingluck Shinawatra, the former Prime Minister, is also reaching out to farmers. She sometimes goes into the countryside and buys rice directly from farmers, trucks the rice to Bangkok and sells it to the urban poor at the same price she paid for it. 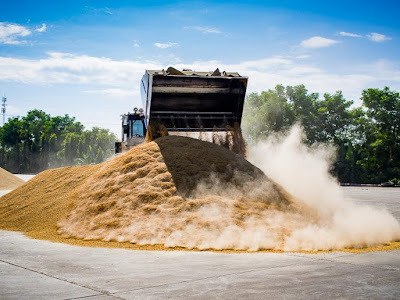 A front end loader creates a dust cloud when it stacks rice at a storage facility in Ayutthaya. Rice farmers are hoping things turn around, but in the meantime they have to harvest their current crop. I like photographing farmers and Thai farmers are no exception. We drove up to Ayutthaya, turned off the main highway onto a narrow local road until we saw workers in the field. We drove out to the workers, who loved the idea of having a photographer around, and I made pictures. I don't speak Thai and they didn't speak English but that wasn't a problem. 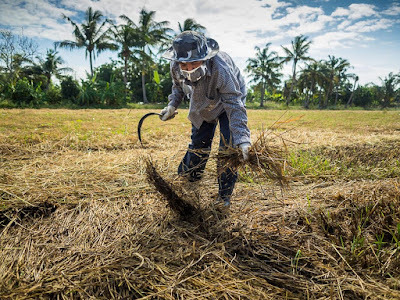 A woman picks up stalks of rice in a field flattened by a windstorm. She was stacking the rice so a harvester could pick it up. There are more photos of the rice harvest in my archive.